The addition of buoyant booby eyes make a pattern much more versatile. A fly can be fished on the surface, but the same pattern can then be fished near the bottom on a sinking line, with the buoyancy keeping the fly just above the weed and in the taking zone. But it's important that the eyes sit straight on the hook, not leaning to one side, otherwise the fly's profile is ruined and it won't fish on an even keel. The sequence on the right shows a neat little trick to making the eyes sit straight on the hook. 1. Take a length of booby cord. Cut off a short length to form the eyes. 2. Insert a dubbing needle into the vice and pierce the needle through the centre of the cut booby cord. 3. 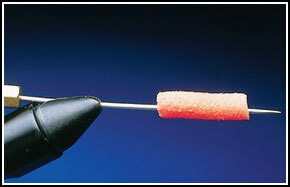 Apply the thread to the middle of the foam in the same way as you apply thread to a hook when starting a fly. After a few thread wraps, finish off with a whip finish and pull the foam off the needle. 4. Now trim the edges to round them off slightly. 5. Your booby eyes are now ready to be applied to the hook. 6. After tying the body and tail of your fly, position the booby eyes just behind the hook eye. Now apply the thread to the central groove on the booby cord and make figure-of-eight thread wraps around the cord and hook shank to secure. The pre-made groove makes application to the hook so much easier and stops the eyes from moving around the shank with each thread wrap. They’ll sit straight. If you're struggling to trim your Booby eyes to shape, try Floozeyes from Veniard (below). They're available in a variety of colours, are perfectly balanced and should be tied on to the hook with a series of figure-of-eight thread wraps. Simple. If you try to attach the booby cord straight to the hook without first using Bill’s tip, it's very difficult to sit it straight. As you apply the thread and start winding, the cord moves around the shank making the eyes sit at an angle to the hook and ruining the fly’s profile. If it's perfectly round painted eyes you're after, then try this tip. Cut the ends off a cotton bud so that you're left with just the tube. Dip one end in paint and then gently push the painted end onto the flat side of the booby eye. You should end up with a perfect, hollow circle of paint. Now just add a dab of paint in the middle for a pupil.